Rich Skrenta thinks he has a better way to provide Internet searchers with the best results. This week, he's launching the public "beta" version of Blekko, a search engine he believes will give users better answers by limiting the information it accepts to a select, curated list of trusted sites, and by making it possible to craft queries that screen out the noise of irrelevant search results. His task seems more than a bit quixotic. After all, few people are complaining about Google (GOOG), and Microsoft's (MSFT) Bing has been hailed for doing its homework and a particularly good job at anticipating user needs. 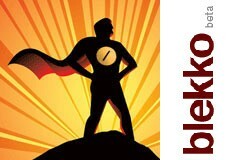 So what does Blekko really have to offer? To some degree, Blekko may be on to something. Search terms that attract lots of content are notoriously hard to police for content quality. Google makes no representations that its results will judge content in any subjective manner: Its page-rank algorithm is quality agnostic in how it measures inbound links and other objective criteria to determine whether a page is a "good" result. Thus, for example, a quick Google search on Sunday night for "cold treatment" yielded among its top 10 results two listings for companies selling relatively lesser-known cold remedies: Blister Blaster and Cold Sore Free Forever, which claims to offer a three-day cure for cold sores and herpes sores. For some reason, the page-rank algorithm likes those two pages -- for now. In all likelihood, Google's ever-improving software will move those listings out of the top results pronto. But with Blekko, these types of pages never appear because it refuses to allow information from untrustworthy sources into its search results. By encouraging its users to help it find the highest-quality data using what they call slashtags, Blekko provides what Skrenta and Co. tout as a better search. Still, the down side to this type of exclusion is obvious. Areas such as forum discussions, newly created content or sites that may have useful information but are not deemed worthy could be difficult, if not impossible, to find using Blekko. The floor of Silicon Valley is littered with the corpses of search engine startups that thought they could take on Google. Even well-funded companies such as Yahoo! have bowed out of the search engine race, and high-powered upstarts such as Cuil have failed to achieve any real traction. But Blekko, backed with $24 million in venture capital from a blue-ribbon bunch of angels and venture capitalists, only needs to capture a small chunk of a search engine market worth more than $10 billion in 2009 in order to succeed. Should Google be worried? Hardly. But it will certainly be interesting to see if Skrenta's theory that some people will prefer human-guided search results proves accurate, and gives Blekko enough acceptance to survive.